eSewa is the first online payment gateway of Nepal which was established in January 2009. Being the first electronic payment system of Nepal makes it the most popular among other online payment gateways. They have linked up with as much as 45 banks in Nepal and also those banks provide an exchange of money for free access. 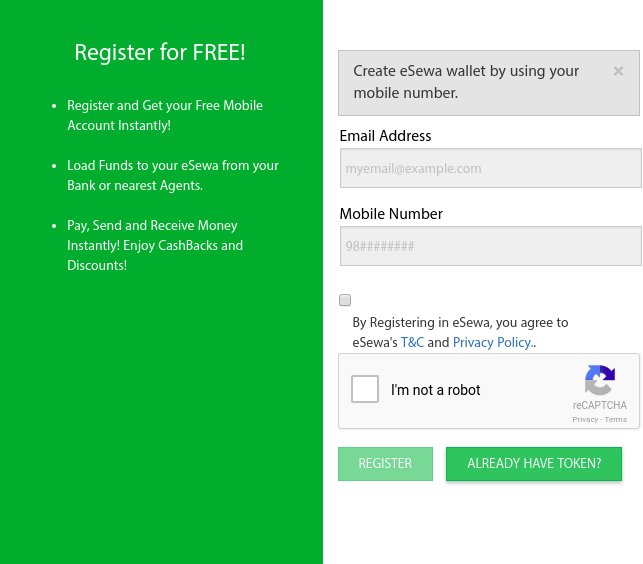 Today we will guide you on how to create and verify your eSewa account in Nepal. Yes, Recently eSewa is Linked with skill so you can receive funds from Skrill to eSewa account. eSewa is updated and in the new design of eSewa, it looks a bit confusing. But we will work our best to make you simple. How Online Payment gateway works? To learn more about how online payment gateway works and other payment gateways in Nepal check this Post How Online Payment System works?. Register eSewa from mobile For Mobile registration please type “REG” and SMS it to 32121 from your NT or Ncell mobile. SMS sent to 32121(eSewa) from Nepal Telecom mobile is free but from Ncell mobile its Rs. 0.50 per SMS. “New” in New Create eSewa account means the New design of eSewa. Remember eSewa is esewa.com.np. First, visit eSewa. Click on Register in the top right corner. You can Create eSewa Account and verify it. Here is New eSewa design Updated eSewa. Then Enter your email and mobile number, Remember you need to have access to that email as you need to verify your email by clicking on the link sent to that mail by eSewa. Click in the checkbox and click in the Google reCAPTCHA for verification then click on REGISTER. You will get an email from esewa. You will get the email that is something like above click on the confirm button. As you click on that confirm button you will get A SMS as XXXXXX is your verification code for registration. You will be redirected to the eSewa page to set a password. Now in the Mobile Token enter the 6 digit verification code sent to you by eSewa. Then set a strong password. (Make a Strong Password) Then you will get SMS from esewa XXXX is your mpin. Mpin == mobile pin :). You will be redirected back to login page. Log in with your email and the password. You are finally on eSewa now you can load fund on your eSewa and start your transaction. Check eSewa Partner Banks. eSewa may take some time to check your account before you add your profile information. even after you add your personal information you need to verify eSewa. Finally, you Create eSewa Account on new esewa ie Updated eSewa design, keep reading this article to Verify your eSewa account. My Account status shows "UNVERIFIED". What does this mean? It means you don't have a complete eSewa profile. You need to keep your eSewa profile complete because of the existing regulatory requirements of Nepal Rastra Bank which states that anyone willing to utilize financial services needs to complete his/her KYC (Know your Customer) form. Why Do I need to become a verified user? Verified users are allowed to hold more than Rs. 9999 on their eSewa wallet. Verified users can receive money through remittance like western union. Verified users can withdraw the amount from eSewa to desired bank account among partner banks of eSewa. If you are an unverified user, your account will be blocked if your account has Rs.10, 000 or more amount. And you can’t enjoy the benefits mentioned above. How to Verify eSewa Account? Verifying eSewa account is quite an easy process. What they need is your Your citizenship card (scanned or photocopy) and Your passport size photo (scanned copy or original). Or any other Nationality verifying official documents. 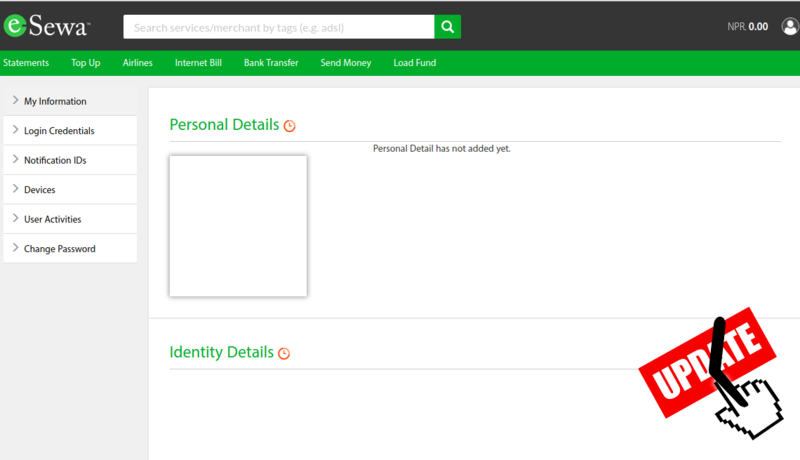 You can verify yourself by updating your eSewa profile with required documents. For that Login to https://www.esewa.com.np, click on my profile and fill the details, provide the valid documents required and request for verification. Your details will be validated and approved by eSewa or you can visit Nearest eSewa Zone with the identification verification documents. As you see in the above image (Personal Details has not added yet.) There should be a form to fill up our personal details. And, you may add verification documents in the identity details.We will update this article whenever the issue is resolved. If you need to verify it Right now. Please Do contact eSewa!